About this item: The life and times of great Mexican artist Frida Kahlo inspire Ana Maria Gonzalez. 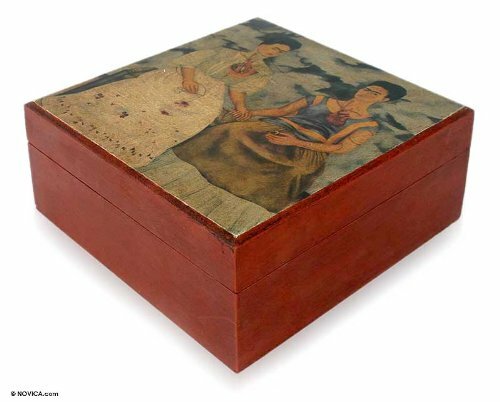 She treasures Kahlo's work in a pinewood box ideal for the display and storage of tea bags. Gonzalez decorates the box with decoupage techniques featuring the legendary "Two Fridas," which Kahlo painted in 1939. It is believed to express her feelings at the time of her divorce from renowned Mexican artist and muralist, Diego Rivera. The box features four interior compartments, while the exterior is finished with a unique tar-based polish for an antique look. Exceptional Artisan Quality by Ana Maria Gonzalez.